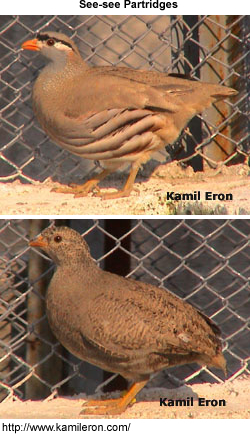 The See-see Partridge, Ammoperdix griseogularis, belongs to the partridge family. Its range stretches from southest Turkey through Syria and Iraq east to Pakistan. It is closely to the Sand Partridge, Ammoperdix heyi., which can be found in Egypt and Arabia. This 22-25 cm bird is a resident breeder in dry, open and often hilly country.When disturbed, See-see Partridge prefers to run rather than fly, but if necessary it flies a short distance on rounded wings. See-see Partridge is a sandy-brown rotund pheasant with wavy white and brown flank stripes. It's about 22 to 25 cm long. The male has a grey head with a black stripe through the eye and a white cheek patch. His neck sides are speckled with white. The head pattern is the best distinction from Sand Partridge. The female is a very washed-out version of the male, and is more difficult to distinguish from its relative due to the weak head pattern. It nests in a scantily lined ground scrape laying 8-16 eggs. The See-see Partridge fees on insects and seeds. The song is a whistled hwit-hwit-hwit.